The Burnett River is a river located in the Wide Bay–Burnett and Central Queensland regions of Queensland, Australia. The Burnett River rises in the Burnett Range, part of the Great Dividing Range, close to Mount Gaeta and east of Monto. 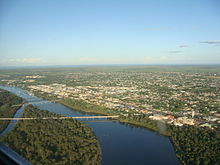 The river flows generally south past Eidsvold and Mundubbera before heading east, adjacent to the townships of Gayndah and Wallaville before entering the city of Bundaberg. The river flows into the Coral Sea at Burnett Heads, roughly 20 kilometres (12 mi) from Bundaberg. The river descends 485 metres (1,591 ft) over its 435-kilometre (270 mi) course. The Burnett River region is largely given over to growing sugar cane and small crops. The river is part of the Brigalow Belt and South East Queensland bioregions. Major tributaries of the Burnett River include the Three Moon Creek that rises near Kroombit Tops National Park north of Monto and flows south through Monto and Mulgildie, dammed near Cania Gorge to form Lake Cania, before emptying into the Burnett River south-east of Abercorn; the Nogo River that rises in the hills north-west of Monto, dammed west of Abercorn to form Wuruma Lake, and flows south-east to join the Burnett near Ceratodus; the Auburn River that rises in the hills about 20 kilometres (12 mi) west of Cracow, flows south before swinging to the north-east at its confluence with Johnson Creek, passing through the Auburn River National Park, a little-known and untouched piece of pristine bush including Auburn Waterfall, and flows into the Burnett River west of Mundubbera; the Boyne River that rises in the Bunya Mountains National Park south-west of Kingaroy and flows in a general northerly direction, dammed near Proston to form Lake Boondooma, emptying into the Burnett River near Mundubbera, only 5 kilometres (3.1 mi) from the Burnett River-Auburn River confluence; and the Barambah Creek that rises in the hills between Kingaroy and the Sunshine Coast, north of Jimna and flows in a general northerly direction, dammed south of Murgon to form Lake Barambah, also known as Bjelke-Petersen Dam, before meeting the Burnett River north-east of Gayndah. The river is named after James Charles Burnett, the first European explorer who discovered the river in 1847. Construction of the Paradise Dam on the Burnett River, 80 kilometres (50 mi) upstream from Bundaberg, was completed in November 2005. The dam reservoir has a capacity of 300,000 megalitres (6.6×1010 imp gal; 7.9×1010 US gal). Named after the old gold mining township of Paradise, which is now submerged under the waters of the reservoir, all of the structures and artefacts found at the site were transferred to the nearby town of Biggenden. The design of the dam complies with environmental guidelines and includes a fish ladder that allows fish such as the Queensland lungfish to travel upstream as well as downstream from the dam wall. The Burnett River, together with the nearby Mary River, is home to the Queensland lungfish, one of the most ancient of the extant vertebrate species. ^ a b Reed, A. W. (1973). Place Names of Australia. Sydney: A. H. & A. W. Reed. p. 49. ISBN 0-589-07115-7. ^ a b c "Map of Burnett River, QLD". Bonzle Digital Atlas of Australia. Retrieved 14 November 2015. ^ "Upper Burnett River drainage sub-basin". WetlandInfo. Department of Environment and Heritage Protection. Retrieved 28 June 2015. Wikimedia Commons has media related to Burnett River. This page was last edited on 22 March 2019, at 02:35 (UTC).